Working exclusively in the education and nonprofit sectors since 2001, Summit’s associates remain on the pulse of the trends, structures, challenges, and opportunities our clients face. Day in and day out, we are engaged with the marketplace—building relationships and developing an ever deeper and more nuanced understanding of the industries we serve, enabling us to become even more effective partners for our customers. Building a robust and diverse candidate pool is critical to any successful search—yet, many institutions and search firms fall short on this front, relying too heavily on advertising and databases without taking the time to do diligent research to identify and contact people in like-roles who may not be actively looking (passive candidates). Summit goes to great lengths to identify and contact top “passive candidates” for every search, a strategy that greatly enhances the quantity, diversity, and quality of the candidate pool–and quite frequently yields the “winning” candidate. We spend significant time with our clients, gaining an understanding of each job role and what a strong and diverse candidate pool would look like. With those insights, we build tailored outreach strategies for each search, and provide clients with data to show the steps that we have taken and the outcomes of each. Our references can attest to the fact that we provide unmatched candidate sourcing, and that our diversity outreach and placement statistics are on par with, or ahead of, other firms. Summit was founded on the belief that search services should adjust to differing needs, situations, budgets, and circumstances. While some searches may very well require comprehensive support, others may benefit from a more streamlined approach focused largely on outreach and building the candidate pool. For that reason, we offer a continuum of tiered service options, enabling clients to customize the support they receive to suit their specific needs. Click here to view our Service Options. Summit is a boutique firm by choice. We take pride in providing our clients with unsurpassed service and we purposely limit our project load to maintain our high standards of time and attention. Each search is serviced by a small, dedicated team that is actively involved from start to finish and able to set and meet aggressive timelines and deliverables. Our high rate of repeat business is the best testimonial to the fact that we provide exceptional service and are seen as valued partners by our clients. Our clients have access to our proprietary, online decision-making tool that enables search committee members to review and rate applicants in a secured portal—dramatically reducing the administrative burdens associated with managing feedback from multiple interviewers reviewing multiple candidates. 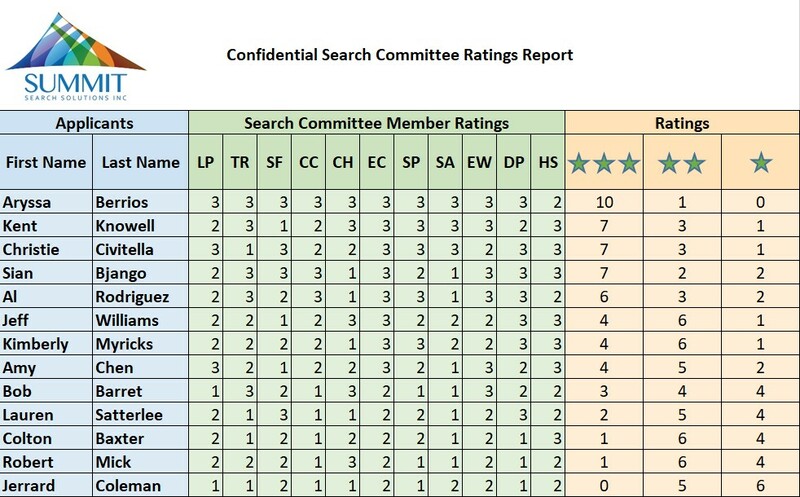 Throughout the process, we provide clients with consolidated ratings reports that may be used by their search committees to support consensus-based decisions on which candidates to pursue.